Hatters duo Mark Cullen and Charlie Walker are eyeing potential Premier League giants Newcastle United or Chelsea in the FA Cup third round. 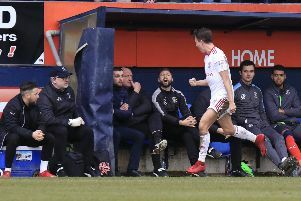 Town will need to beat Bury in replay next Tuesday night first, but Cullen, who scored against the Shakers on Saturday, said: “If we got Newcastle away I don’t know what would happen, but it would be the ultimate dream. “We’ll see what happens. It doesn’t really matter who we get. Obviously you want a big flashy tie in the third round but we’ll just have to see who we get. We’ve got to get in there first. Meanwhile, Walker, who made his first start for Town at Gigg Lane, continued: “I’m a Chelsea fan, since I was young, so that will be nice. “You want a Prem team really don’t you. Anyone in that league. It will be great to play at a stadium like that, so fingers crossed it’s Chelsea. Hatters boss John Still was eagerly anticipating the third round draw this evening too as he added: “Would we have wanted a replay? It’s better than going out, so absolutely. It’s all right, we’ll look forward to it.